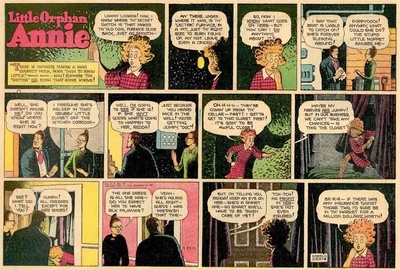 In 1924, a comic strip artist named Harold Gray created a new comic strip for Captain Patterson's New York Daily News. It was called Little Orphan Otto, and was one of the better ideas he had come up with. Patterson thought it looked like a good concept: the little orphan not tied to any one location but free to roam from place to place and through various adventures without the hampering presence of a family. But, he counselled Gray: "He looks like a pansy. Put skirts on the kid." (Marschall 166) Gray complied, and changed the name from "Otto" to "Annie." 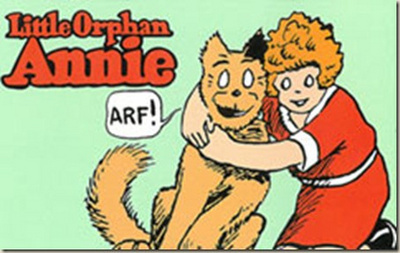 Thus Little Orphan Annie was brought into the world on August 5, 1924 and continued successfully until Gray's death in 1968. 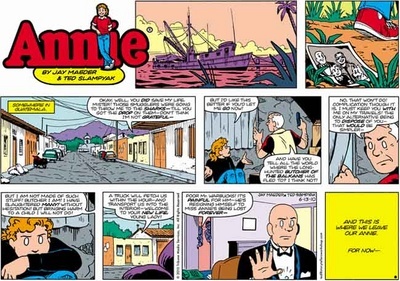 For 44 years, readers followed Annie through a myriad of adventures that could be as simple as staying at a farm to outwitting Nazi infiltrators. 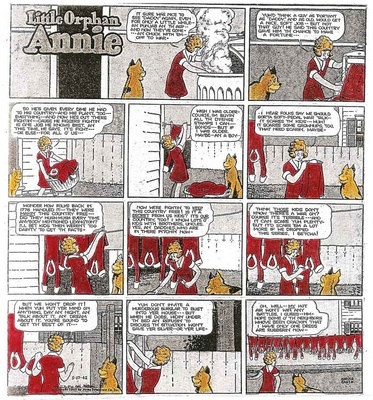 Annie stayed perpetually twelve years old, endowed with the wisdom of the ages and the innocence of eternal childhood.